Sermon Spice offers relatively affordable and very useful videos (categories by topic, holiday, scripture, etc.). They can be used in a variety of settings. Bluefish TV is similar but cheaper; however, the videos are generally of lower quality. RESOURCE LINK Recommended by Churchnet Staff: Recommended by a friend of Churchnet. BibleGateway provides online access to multiple translations of the Bible. It features 22 different English versions as well as multiple other languages. RESOURCE LINK Recommended by Gary Snowden: This website allows the user to search for a specific passage, a keyword, or a phrase in various versions of the Bible. The site is a non-profit, national, independent, diverse organization of Baptist historians and other individuals and partner institutions who are committed to communicating the story of Baptists through the study, interpretation, publication, and advocacy of Baptist history. Our Mission Statement is: Helping Baptists discover, conserve, assess, and share their history. This website provides information here helpful as you seek to understand the beliefs, polity, ministries, practices, organizations, and heritage of Baptists. The information useful for Baptists and non-Baptists alike. 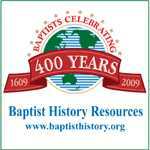 RESOURCE LINK Recommended by Jim Hill: The site provides great information about Baptist heritage.